Drusy (also known as Druse or Druzy) is a term used to describe a coating of crystals on another stone. So, basically druzy jewelry is crystal-covered rock. The crystals are sometimes extremely tiny and can have a sparkle (especially gorgeous in sunlight) or almost glittery look to them. The drusy quartz gems grow slowly over millions of years and are found as the very last layer of growth on agate or another colorful base. While they look sparkly and delicate, druzy quartz is a fairly durable gem. We are committed to provide innovation, high quality and meaningful jewelry to inspire love, kindness and consciousness in the world around. Every jewelry has its own unique meaning. It will be one-of-a-kind jewelry. A.Comes in a fine gift box and meaningful gift card. B. Meaningful design to show your love . C. Drusy quartz is a fairly natural, rare and durable gem. D. Perfect for all occasions: anniversary, engagement, party, meeting, dating, wedding, daily wear, etc. F. A special treatment for yourself to reminder to smile, share more love, create meaningful moments. Apply beauty products prior to wearing your jewelry. Remove jewelry prior to swimming or bathing. Use warm water and a mild soap, rinse jewelry and pat dry. To avoid black markings on your skin or jewelry, clean jewelry regularly. Store jewelry separately - in a protective container and keep away from moisture. ♥GRATEFUL& THANKFUL& BLESSED♥ Thanksgiving, after all, is a word of action. This jewelry set says it all. A perfect reminder for yourself or as a thoughtful gift for someone you love! Each textured set reads "Thankful, Grateful, Blessed". 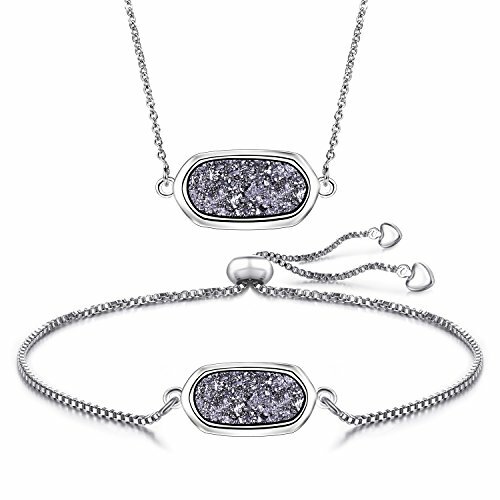 This drusy jewelry set as a gift is always notable and never forgotten with the meaningful design, and you can write your sincere words on the gift card. It is a one-of-a-kind gift for express your grateful, thankful and blessed. ♥ DESIGN IDEA♥ Drusy jewelry is set in a manner that displays the magnificent color and crystal like designs within the beautiful beads. These amazing stones are a result of years of pressure and formation. Just imagine the time and effort involved in causing this tiny gem that is now here for your enjoyment! The drusy bracelet means never ending love & friendship, timeless grateful& thankful& blessed. ♥PERFECT GIFT♥ Drusy set is a perfect and ideal gift for ladies for Thanksgiving, Christmas Day, Anniversary Day and Birthday to friend, wife, mom, daughter or someone special! It can be used in any occasions, such as, wedding, birthday party, prom or pageant. This type of elegant bracelet will decorate your beautiful mood and attract great attetions. ♥PERFECT AFTER-SALES SERVICE♥ We are committed to provide higher stander jewelry and the best services to our customers, your feedback is our motivations to improve. Please do not hesitate to contact us with any questions or concerns. Your happiness is our number one priority. We are looking forward to your review. We will try our best to promise you an enjoyable shopping experience. If you have any questions about this product by WISHMISS, contact us by completing and submitting the form below. If you are looking for a specif part number, please include it with your message.